Ball handling is key for players of all positions in today’s game – these drills will help develop this important skill. Two skills that all player need to have in there repertoire are the ability to handle ball pressure and change directions to get by a defender. A team can never have enough ball handlers, so even if a player is not a primary ball handler, it is important to work on these skills to grow and expand their game. I’m going to discuss several drills to help players handle the ball under pressure and get by a defender using change of direction moves. Many players get passive when they are met with heavy ball pressure. This is a mistake – they should actually do the exact opposite. The best way to beat pressure is to attack it, using the pressure against the defense. Too often players shrink and put their weight on their heals, and expose the basketball to the defender when pressured. All coaches have seen players get pressured and immediately pick up the ball, raising it above their head leaving. This opens up the opportunity for the defense to get up into them. When met with pressure, players should stay calm and make an assertive move against the pressure. 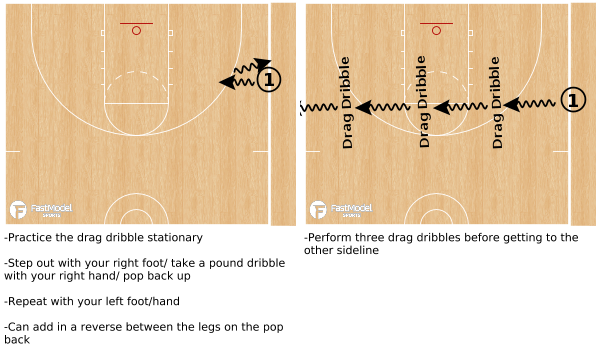 A drag dribble or retreat dribble creates space and relieve the pressure. Instead of dancing and making a bunch of dribble moves that don’t take them anywhere, players need to dribble down hill toward the defender and use their body to get into the defense. Once they get the defender going down hill, the ball handler can use a drag dribble to stop and allow the defender to keep going, thus creating space between them and the defender. 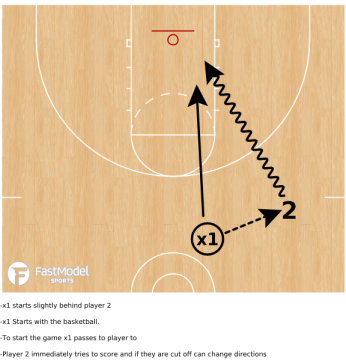 Another move that a ball handler can use to get out of pressure or if they are cut off is to use a retreat dribble as shown below. When retreating, it is important that the ball handler keep their chin on their shoulder and the ball on there back hip away from the defender. Changing directions with the basketball and being able to quickly get down hill toward the basket is a difficult skill for players to master, but becomes more and more important at each level as defenses get better. When changing directions, it is important to get low into the dribble move and stay low after making the move. Getting and staying low allows the ball handler to have leverage over the defense so they do no get bumped off of the driving line. The driving line is also an important concept for players to understand and practice during drills. The driving line is the line between the ball handler and the basket. 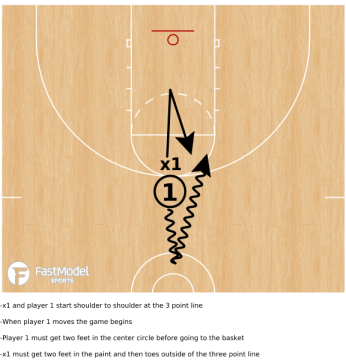 Once a change of direction move is made, the ball handler must try to get back on this line to take a direct bath to the basket, absorbing any contact from defenders along the way. Teaching players when to change direction is also crucial. At the youth level, far too many players stop going to the basket because either they received a little contact or, they do not know the proper time to change direction. It is important to keep reads as simple as possible so players are able to react as quickly as possible during a game. If a player gets outside their defender and only sees the defender’s shoulder, then they should attack that shoulder and get down hill toward the basket. If the ball handler sees the defender’s chest (so the defender is square with the ball handler), then the ball handler should change directions. This rule must also be applied when the ball handler is driving. The ball handler should keep driving to the basket on the same side until the defender cuts them off and gets square with the offensive player. 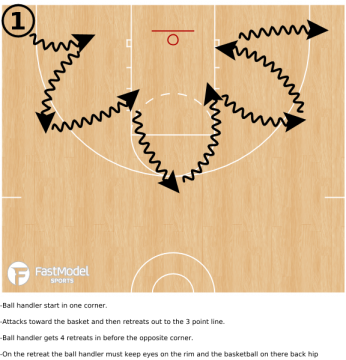 Here are a few change of direction drills that rep these situations. 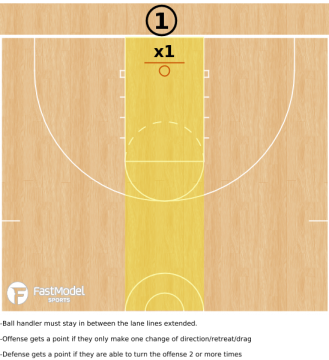 These next two drills are what I call “game like” as they simulate a live situation by including a defender. Progress to game like drills once players have completed the basic individual drills. Many ball handling drills that I see are performed from a stationary position. 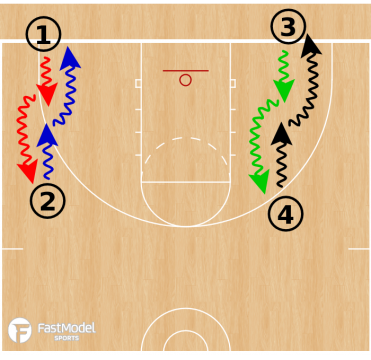 Incorporating on-the-move drills is a must in any workout as that is how the game is played. Focusing on small details such as staying low and getting back onto the driving line are little details that can make a huge difference in a player’s ability to gain and keep an advantage against a defender. 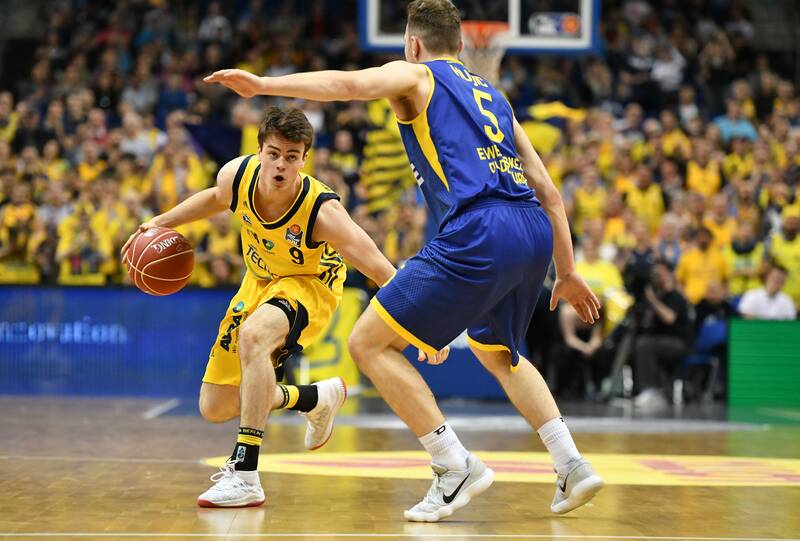 No matter what position, a player will eventually be met with hard ball pressure and it is important to have the skills and knowledge to be able to attack and beat it. Moves and technique can be refined individually, but it is important to go against a live defender to truly understand when, why and how to perform a pressure relief move or change of direction dribble. For more #PositionlessBasketball content, follow @PositionlessBb on Twitter.